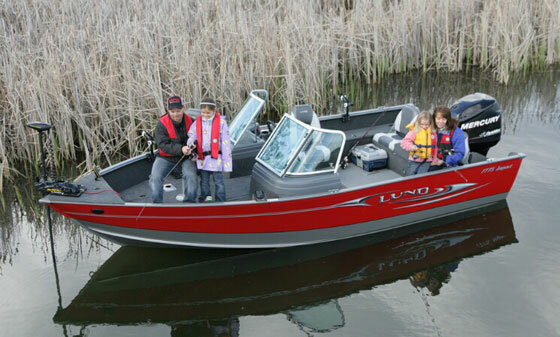 Comfortable and roomy, this aluminum fishing boat can also do double-duty as a family runabout. 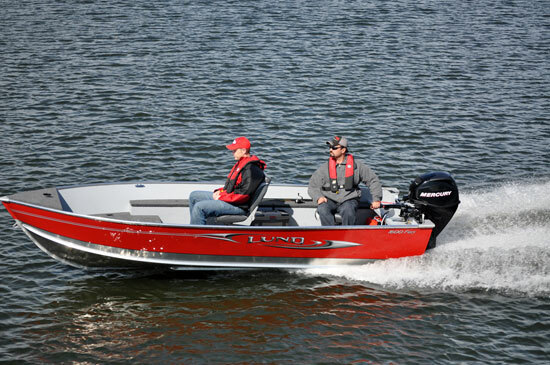 I had a chance to demo the new 18-foot one-inch Lund Tyee 1800 powered by a Mercury Four-Stroke 150 outboard, and it’s a great new interpretation of the classic Tyee platform brought to the market as Lund fine-tunes its big-water aluminum fishing boat line for 2013. The 1900 Tyee is another new model for 2013, and these two boats bracket in size and replace the 18-foot 6-inch 1850 Tyee. Tyee is designed for hunting big fish on big water. The Lund SportTrak system mounts accessories, like the downrigger shown here, anywhere on the gunwales. 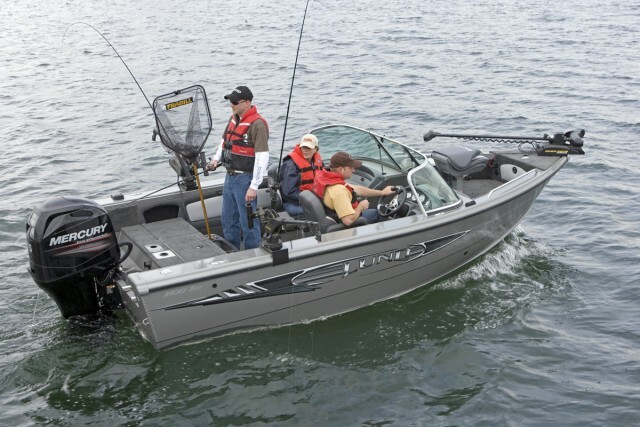 Lund designs its Tyee models with more freeboard and a deeper cockpit than its Pro-V walleye boats, and has a deck layout more oriented toward jigging and trolling than casting. This will appeal to anglers fishing wind-swept Western impoundments and big lakes in the Midwest, including the Great Lakes. The Tyee 1800 cockpit is 27 inches deep, which is five inches deeper than a Pro-V model of similar length. The Tyee cockpit is also longer, at the expense of less room on the bow deck. All Tyee models have dual consoles and a tall glass walk-through windshield. 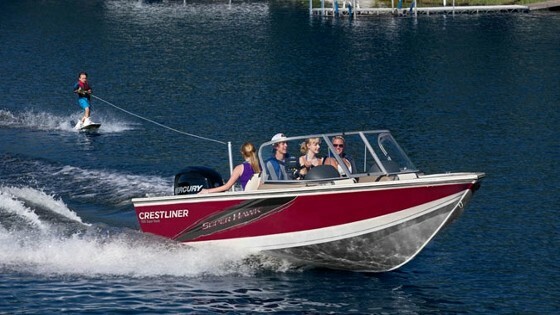 While anglers who want to put family features front and center may gravitate towards a model like the Lund Crossover XS (see Lund offers Fishy Family Fun), that added depth and a new IPS2 running surface with 16 degrees of deadrise do make the Tyee a viable “duo-sport” boat that can function as a family runabout when called upon. Add a set of optional cushions to the padded backrests on the front of the consoles and this boat can do a fair bowrider imitation. 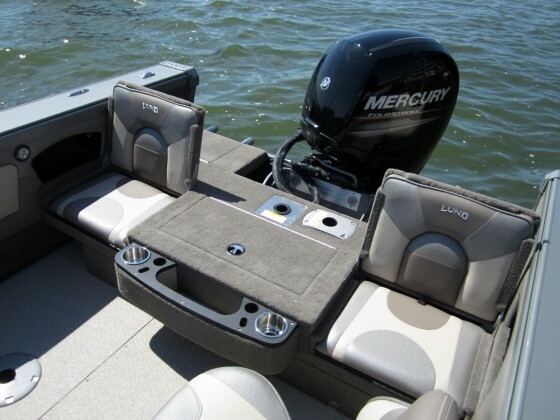 The center of the bow deck can also be folded down to create a foot well, or doubles as a cooler stowage compartment. The 1800 Tyee comes with three Pro Ride seats, but there’s room for a fourth in the cockpit plus a set of jump seats in the aft corners which become part of the aft fishing platform when the backs are folded down. A ski pylon is an option. The backs of these jumpseats fold down to become part of the aft deck. A live well is on center. This boat has a full complement of angling amenities, including lives wells in the bow and stern decks, lots of stowage in the bow deck including room for two batteries and a spot in the peak for a trolling motor pedal, and a big rod locker in the deck that will hold 10 sticks -with even more rod stowage in the inwales. A boarding ladder is standard, as is the extension on the forward edge of the aft deck that incorporates drink holders, a cubby for small items, and slots for tools and even a net handle. Our test boat had the optional vinyl flooring on the cockpit deck, which is easier to clean and faster to dry than carpet. 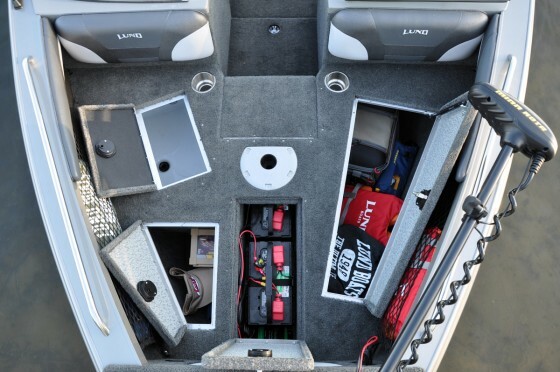 There’s a live well in the bow deck and lots of stowage, including a spot for trolling motor batteries. Bolsters on the consoles are standard equipment. The helm has a sport wheel, white-face instruments set in a dark insert, chrome switch gear, and a spot for the optional Sony audio system. There is room on top of the console for moderate-size electronics, but the biggest screens will require a pedestal mount. The helm put me in a great position during a short test drive; the seat is high off the deck and visibility is excellent. The Tyee handled well in a light chop and hit 48 mph with the Merc at full throttle. 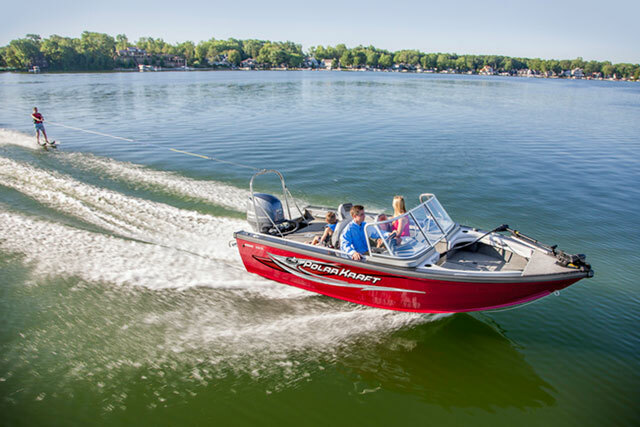 This version of the ISP2 hull has a single strake on each side of the running surface that extends about three-quarters of the boat length and is there to knock down spray, not to provide lift. 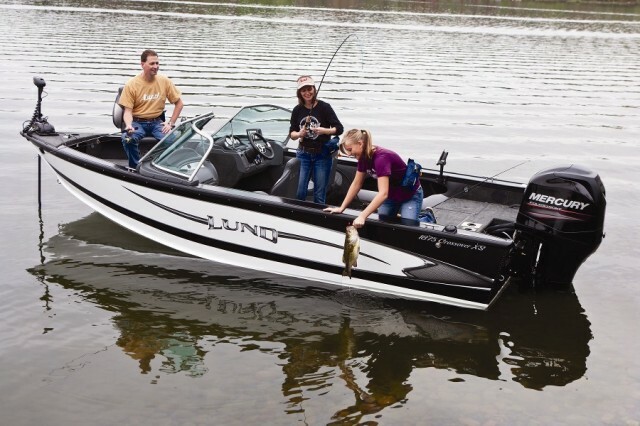 Like all Lund aluminum boats, this Tyee features mostly riveted construction, I-beam stringers and a double-plate bottom for added durability. Fit and finish and materials throughout this premium model are first rate. The 1800 Tyee offers a nice combination of fishability, comfort, and even a little luxury. 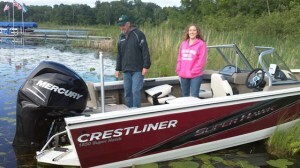 Other Choices: The Crestliner 1850 Super Hawk is going to be running the same waters with a similar mix of family and fishing features, as will the slightly smaller Starcraft Starfish 176. 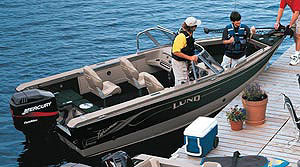 For More Information: visit Lund Boats.